It's a fairly light episode in all, not a huge amount of continuity on display. It is the only episode so far to focus on the Pizzas though, who are fun and interesting. Something that is established: Pearl's pretty confident that the Pufferfish, once knocked away from the beach, will come back. In the first episode, the Centipeedles were trying to get inside the temple. Why would she be so sure the Pufferfish would return if it didn't have the same aim? My guess: it's something about the Crystal Temple that's attracting the monsters. Is this related to the Crystal Heart shown in Together Breakfast? Previously I identified the last name of Kofi's family, who speak with a Ghanan accent, as Gunga, but characters seem to refer to them as the Pizzas pretty consistently. I've only seen the name I identified earlier sourced once, so I'm going to refer to them as the Pizzas until I see evidence otherwise. This is the first formal introduction to the Pizza family. Kofi is the patriarch, his mother is the short older woman Nanafua (the show wiki says her formal first name is Gunga, that's probably where I had gotten it from), and his daughters who work in the store are Kiki and Jenny. Jenny works delivery, has a pizza-themed car, and is one of the "cool kids" from Lars And The Cool Kids. Speaking of the family. So, Steven has his dad, but his mother gave up her physical form, so now he's raised by the Gems, who are kind of like aunts. Of the Frymans, the Pizzas, the Yellowtails and the Deweys we've yet to see a mother. The only nuclear family we've seen to date (as of E37) is Connie's, the Maheswarans. We know Sadie has a mother we've not met. It's like most of the moms in our part of Beach City have "given up their physical forms," not just Steven's. Speaking of that grill: Steven actually has some pretty well-developed cooking skills. He can grill, we've seen him baking, and of course there was the Together Breakfast although that was microwaved and toasted stuff. Steven seems more self-sufficient than your average 12(?)-year-old. I mean, grilling over charcoal is something usually reserved for grownups. He did organize and throw the Gems' birthday parties, and the beach party here. But we know that the Gems also bake, at least (they make cookies in Warp Tour). We've seen Pearl wash dishes, but it seems that Steven doesn't have a "dinnertime," that his meals are more ambiguously-spaced than that, possibly due to the time demands of the Crystal Gems' missions. I suppose that Steven eats out a lot; it helps that the Beach City Boardwalk is in walking distance of the Temple. While we're on the subject: Steven's grilling hot dogs and hamburgers. It occurs to me that we've yet to see a single grocery store, from the outside or inside. Evidently there must be one nearby; it's unknown who buys food ingredients for Steven. As the Pizzas walk up, you can hear one of them say she's never seen this side of the beach before. Could it be that the area is not generally frequented by humans, for some reason? Note, despite being called Beach City, we haven't seen a lot of human tourist traffic around yet. What do the Gems do when beachcombers come around? The Gems turn their changing into their beachwear into a transformation sequence! Kofi, wonderfully, is not impressed a bit. "So, you are a circus act!" Do the Gems just not have that much experience with human introductions? Nana: "Aren't you guys hungry? You barely touched your food!" G: "We don't need to eat." Nana: "Oh you young people and your experimental diets." G: "I am much older than you." Awkward! We already knew that Gems don't age, and So Many Birthdays implies that Gem bodies are at least somewhat illusory, but in the running order of the episodes it's the first indication that eating is optional for them. Pearl tells the Pizzas that the temple has been here for thousands of years. That puts its construction well into the age of Native American ascendancy in the area, although we don't know if the writers considered that far. 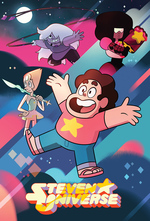 Steven suggests a volleyball game, which segues into the the return of the Pufferfish and the fight against it, with the Gems and Pizzas both playing roles. Notably, it's Nana's plan that defeats the fish, which I presume the Gems went along with because their previous tactics were of no use against it. The volleyball game, with careless use of Gem powers throughout and some dirty tricks on the part of Jenny and Kofi Pizza too, is entertaining, but I think seems a bit overdone, like they were trying to give the human characters something to do in the fight. Humans not being worthless in fights against Gem monsters is something we've seen done well before (unpowered Steven against worm in Bubble Buddies) and will see again (Sadie against the invisible monster in Island Adventure), but here it seems like they're reaching a bit, at least to me. During the game, Garnet spikes the ball so hard that it glows red, and turns the sand to glass when it strikes. But the ball itself is unharmed! "Jennifer! You touch that ball and you're grounded!" NO FAIR USING FATHER POWER. The Pizzas don't express much amazement at the blatant display of Gem powers or the attack of the Pufferfish. Contrast this with Connie's reactions from the previous episode. Is this Beach City familiarity breeding contempt? It ends with Kofi Pizza unbanning the Gems from his establishment. They hardly seem to care. I guess when they order pizza (presumably for the benefit of Steven and Amethyst) they get it from a different place. Here's my thought on how humans react to Gem powers and technology. Gem ruins are stated to be thousands of years old, which means at a minimum Gem presence on earth dates back to antiquity. I suspect that Gems were present on earth long before any human civilization, meaning for all of human history humanity has been living in the shadow of crazy Gem ruins. Mountain temples and ocean spires and mystical islands are all just the background radiation of civilization, treated sort of like the ancient Neolithic ruins present today: curiosities that have always been there with very few archaeologists convinced we'll ever really know what they're about. This doesn't really explain the blasé reaction people tend to have to actual living Crystal Gems and the weirdass Gem monsters they fight, but if Connie is any indication that seems more like a Beach City thing than a mankind thing. I think it is this blasé attitude that gets Ronaldo so worked up and leads to Keep Beach City Weird (the episode). I love how non-generic the Pizza family is and how they align with the Crystal Gems. This isn't the first time that denizens of Beach city have aligned well with the Crystal Gems respectively (Lars & the Cool Kids), but I wonder if it's more of a stylistic choice by Rebecca Sugar, et al than it is a sign of some sort of cosmic gem force. The elder gems wouldn't need flight to access the washing machine. There's a warp pad up there. There's still the mystery of how the washing machine is powered, however. Yeah, a lot about that washing machine has been explained since I wrote that (there's even been a couple of scenes up there), but we still don't know how power and water get there.